Laura Tucker was tired of tubs of yogurt and plastic baggies filled with almonds — tired of the sad little snacks she always had to tote around, ever since a gluten-free diet cured her of the stomach ailments that had plagued her for the better part of two decades. Like many gluten-free eaters, Tucker was a snack-carrier by necessity. Out in the world, she just never knew if she would be able to purchase something substantive to eat — whether in a restaurant or in a convenience store or in the Starbucks where she sat with her sister, Sharon Pearlstein, one day in the fall of 2011, lamenting how lunch was, once again, yogurt and nuts, when all she really wanted was a sandwich. Then came an epiphany: Tucker and Pearlstein, native New Yorkers, had been drawn to the Bay Area because of its vibrant food scene. Neither was working at the time. They thought, why not start their own food company — one that could provide the kind of tasty grab-and-go option that didn’t seem to exist for gluten-free eaters? Why couldn’t they be the ones to make that elusive sandwich? In January, about a year (and countless hours in the test kitchen) after that initial conversation, Tucker and Pearlstein launched Sista Sandwich. 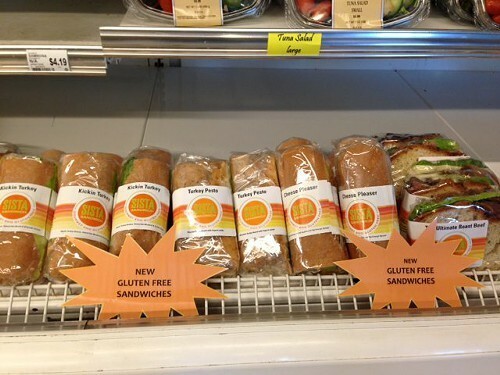 Their pre-packaged gluten-free sandwiches, which have a two-day shelf life, are now sold at several locations in Berkeley: Berkeley Bowl, Cafe La Renaissance (3045 Ashby Ave.), and a few small cafes on the UC Berkeley campus. Prices vary by location, but each sandwich generally costs between $6 and $7. As she and her sister developed their first sandwiches, Tucker said she realized why there weren’t a lot of similar products on the market: It’s a difficult thing to get right. Any large food company that deals in pre-packaged food products is going to have a cross-contamination issue. (Tucker and Pearlstein assemble and package their sandwiches at a commercial kitchen facility in Oakland, but they have a separate room that’s kept entirely gluten-free.) Ingredient-wise, the biggest challenge was, of course, the bread. Tucker and Pearlstein sampled dozens of gluten-free breads before they found two companies — Udi’s and Canyon Bakehouse, both based in Colorado — whose products worked best for their purposes. These breads tasted good and, just as important, held up well after they’d been assembled into sandwiches and refrigerated for a number of days. Now, the sisters’ line of offerings includes seven sandwiches: roast beef, salami, hummus and veggie, AB&J (almond butter and jam), plain turkey, turkey pesto, and — Tucker’s personal favorite — the “KickinTurkey,” which is spiked with Bone Suckin spicy mustard. In the next couple of months, they plan to launch their first non-sandwich product, a bento box, which might include a scoop of tuna, a salad, a couple of gluten-free triangular “toasties,” and a cookie or pastry. 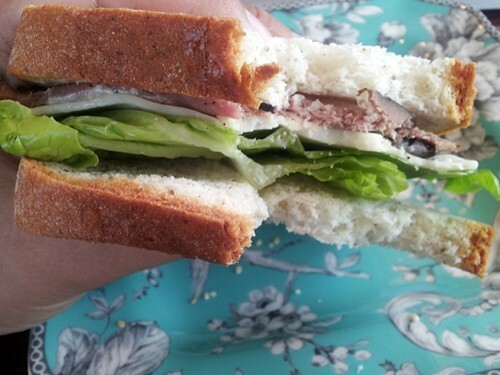 I had a chance to sample the roast beef sandwich during a recent visit to Cafe La Renaissance, and my response echoed the feedback Tucker often gets from non-gluten-free eaters: “Not bad.” The bread was a little bit dry and crumbly, and tended to melt away, like puffed rice, in my mouth. But the bread’s flavor was decent — nearly wheat-like. And a generous smear of kicky horseradish spread added interest to the straightforward combination of cold-cut-style roast beef, lettuce, and Swiss cheese. It wasn’t a gourmet, restaurant-quality hot sandwich, and it wasn’t something that non-gluten-free eaters will want to rush out and buy. But judged against the kinds of prepackaged sandwiches that are commonly sold in the refrigerated section of supermarkets and convenience stores — the kind you’d pack for a bagged lunch — it was better than okay. Indeed, where Tucker sees Sista Sandwich really taking off is in places where food options are extremely limited, especially for those on a gluten-free diet: at airports and, fittingly, at big box coffee shops like Starbucks. The sisters have started exploring those kinds of partnerships, but obviously that would be a big step up in terms of the scale of their production. In the meantime, with the proliferation of companies like Sista Sandwich, sufferers of celiac disease and other gluten-free eaters move one step closer to a day when they won’t have to pack snacks obsessively — when, like the rest of us, they’ll be able to step up to any deli counter or inside any convenience store and find something good to eat.